Last week, I mentioned that retail investors have been seduced by a can’t-lose investing strategy that might stop working (and fail spectacularly) right at the worst possible time. You might have heard that there were three dissents at the FOMC meeting yesterday—a rare occurrence indeed. I’ve taken bond math classes out the wazoo. The best of them was in the summer of 2001 at Lehman Brothers. Lehman Brothers wasn’t going to teach a bad bond math class, not at the firm that became synonymous with bond trading itself. I was ready to start whipping ‘em around. Pity I ended up in stocks. Now, the tables have been turned, and I am the old, wizened professor, dropping some knowledge on the younger generation. I occasionally teach finance to MBA students, and there are a couple of chapters on bonds where the students have to get their calculators out. The sensitivity1 of a bond’s price to changes in interest rates. It is the second definition that most people know. If you own a bond, you are exposed (positively or negatively) to changes in interest rates. If interest rates go up a percent or two, you want to know what is going to happen to the price of your bond. 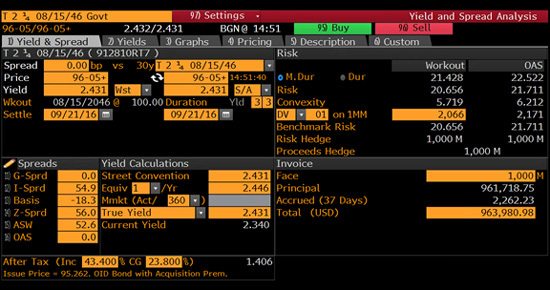 The on-the-run 30-year bond has a coupon of 2.25%, which is about as low as you can get, which means lots of duration. We’ll talk about this bond in a second. Made for an interesting class. 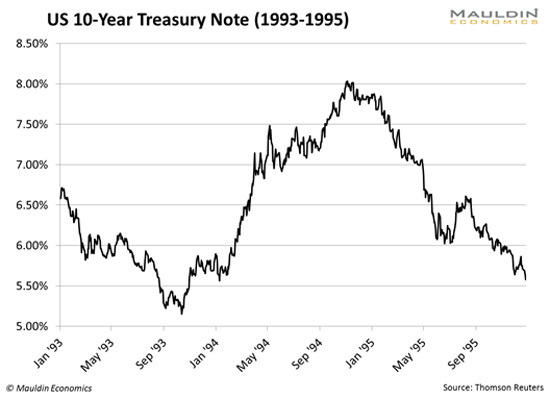 If interest rates go up one percent, the price of the bond will decline approximately (duration) percent. It’s a thumb rule, it’s not exact2. 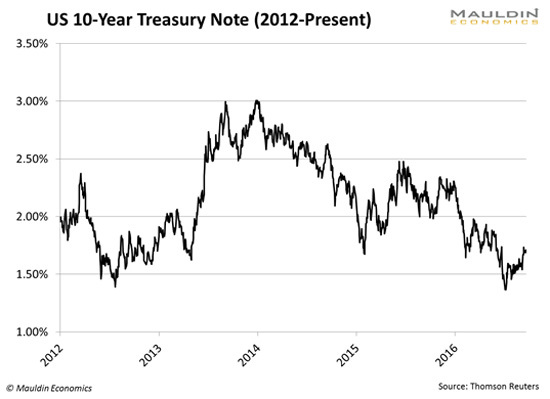 So yes, if the duration of a 10-year note is 9, and interest rates rise from 1.6% to 2.6%, the bond will lose approximately 9% of its value. So rates go up 1% and a bond goes down 9%. Is that risky? You mean bonds lose value? That will come as news to most people, because bonds are safe, you always get paid the par value in the end3. Actually, bonds can lose a lot of value. And my guess is that people have been lengthening their duration in order to get a little extra yield. By moving into long-dated bonds, people have massively increased their interest rate risk. Lots of people are in long-term government bond funds. Okay, so what is the duration of the on-the-run 30-year bond? Are bonds risky? You bet. What happens if interest rates rise by two percent? Certainly not unheard of. The price of the bond will decline by 35-40%. My guess is that people don’t know that their government bond funds could decline by 35-40%. My guess is that their financial advisors don’t even know that. Most financial advisors have not taken the fancy bond math class at Lehman. They took the Series 7, which doesn’t quite cover it. Think about this: if people thought that there was a realistic chance that stocks could go down 35-40%, would they invest in stocks? No. If people thought there was a realistic chance that their bond funds could go down 35-40%, they would probably sleep with one eye open. Corporates have duration, too. The math is a little more complicated once you start introducing credit, but yes, a corporate bond is also sensitive to changes in interest rates. Remember the “taper tantrum” of 2013? There was some aggressive chatter about rate hikes out of the Fed, and it sent 10-year yields from 1.6% to 3%, in a hurry. Remember what else happened at about the same time? The big Apple bond issue. Apple issued billions of 10-year paper, one of the biggest bond issues ever, and no sooner was the trade ticket stamped that the bonds went from 100 bid to 90 bid. And everyone was like: Holy cow, I just lost 10% on Apple bonds. These bonds have interest rate risk! Interest rates have been going down for so many years, I think people have forgotten that they can go up. And that bad things can happen when they do. I’ve been pretty noisy about calling for higher interest rates, which has been the wrong call, but I will say this at least: when it happens, it is going to be ugly. People are completely unprepared. In fact, it could be the biggest trade in decades. Remember 1994? Rates back up a few percent, Mexico blows up, Orange County blows up, Procter & Gamble blows up—to name a few. When interest rates go up, stuff blows upTM. Are your stocks and bonds at risk from the Fed? 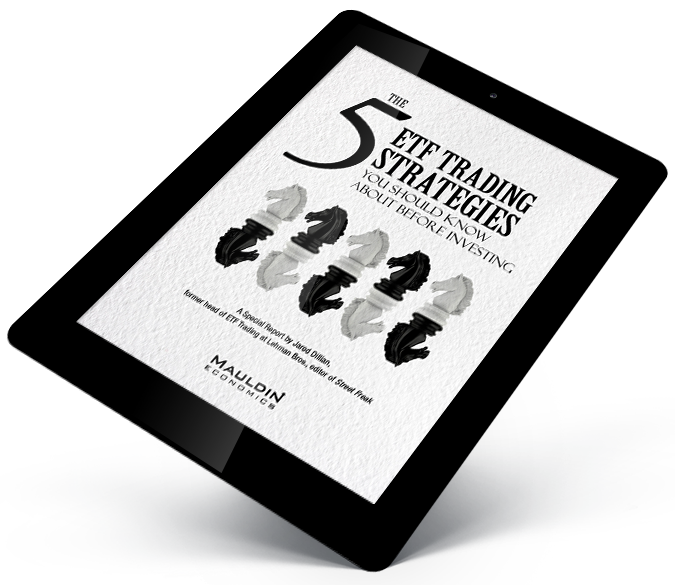 In Street Freak, there’s a great contrarian pick that might smooth out the volatility in your portfolio. I suggest you give it a risk-free try—if you sign up today (or any time before September 30), you’ll save 33% off the regular subscription fee. 1 Some people refer to duration as a measure of bond price volatility, but volatility is something different. It is the sensitivity to changes in interest rates. Small but important semantic difference. 2 And because it’s not exact, people are going to get upset, but the whole point of a thumb rule is to get people to understand a difficult concept more easily. Making people do the math doesn’t help anyone understand anything. 3 So much wrong with this statement.